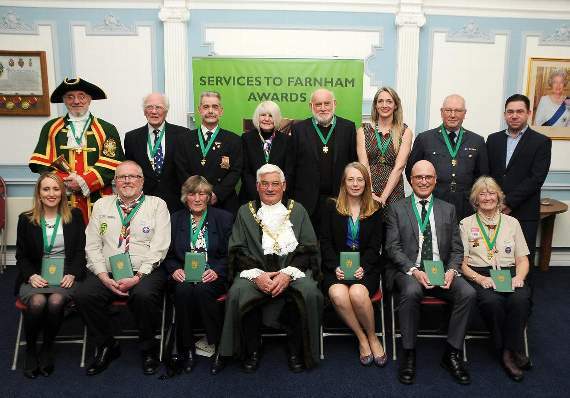 FRIENDS, family and local dignitaries packed into the Farnham Town Council chamber on Monday night to celebrate the outstanding public service of 12 community heroes. The 12th annual Services to Farnham awards, sponsored by Tindle Newspapers Ltd, saw much-deserved recognition heaped on an array of figures from all fields of town life. Celebrated achievements ranged from the establishment of Farnham Hospital’s pioneering integrated care hub to empowering disadvantaged children through dance, orchestrating Farnham’s Remembrance Sunday parade and increasing opportunities for young people through the scouting and cadet movements. Each recipient was nominated for the award by a member of the public, colleague or family member, with the final shortlist endorsed by councillors at the full council meeting in January.